The restoration of cultural property involves using what exists, and is known of, an artifact to produce a representation of the complete object as it would have been in its earlier form. Ceramic vessels, having a large representation in the archaeological record and being a nice object for display purposes, are often chosen to be restored to their original state. 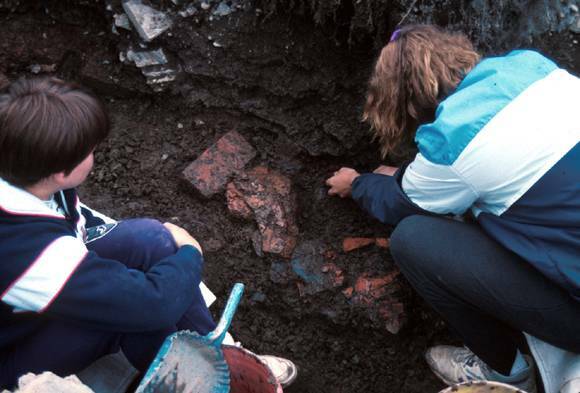 The ceramic assemblage for the Ferryland site includes coarse earthenware, tin-glazed earthenware and stoneware. Ware types include everything from cooking pots to ointment jars to bed pans to mugs. 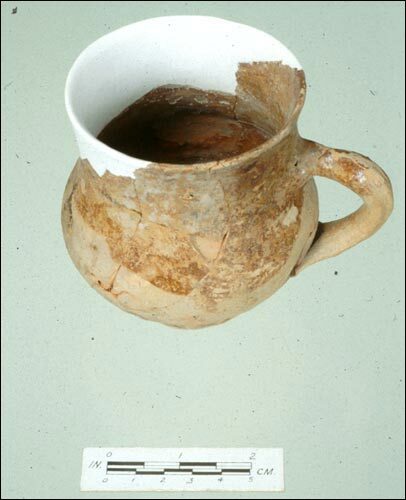 Generally ceramics are well preserved in the burial environment and require little stabilization/conservation. 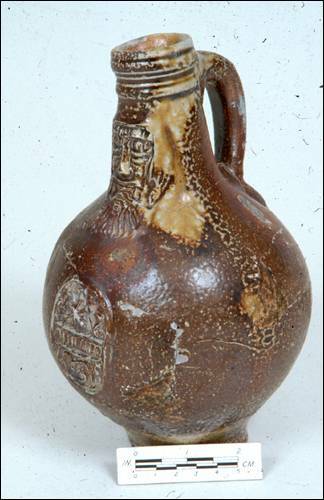 Generally ceramics are well preserved and require little stabilization/conservation. As a result, ceramic restoration is often possible for many vessels. The restoration of a pot, for example, can only be attempted, however, if a full profile of the pot exists; that is, if the rim, body, base and handle(s) exist, then the missing areas can be filled to match the original shape. Dental plaster is often used as a fill material because it can be easily carved and is reversible. Once the fill has been carved down to the original surface the conservator may paint the plaster matching it to the 17th-century glaze and/or clay body. This jug has been fully restored and painted. These stoneware jugs were made in the Frechen region of Germany and used to hold distilled spirits. This one was broken and discarded about the time of the Dutch raid in 1673. When restoring an artifact to resemble the original object, the conservator must not alter the object. All restoration processes must be reversible. Therefore, appropriate glues are used to adhere ceramic sherds so that the process of joining the fragments can be reversed in the future.